The Day Shimon Peres Returned To His Boyhood Village : Parallels Like many founding fathers of Israel, he was born in Eastern Europe. After the Soviet Union collapsed, he returned in 1992 searching for his old family home. 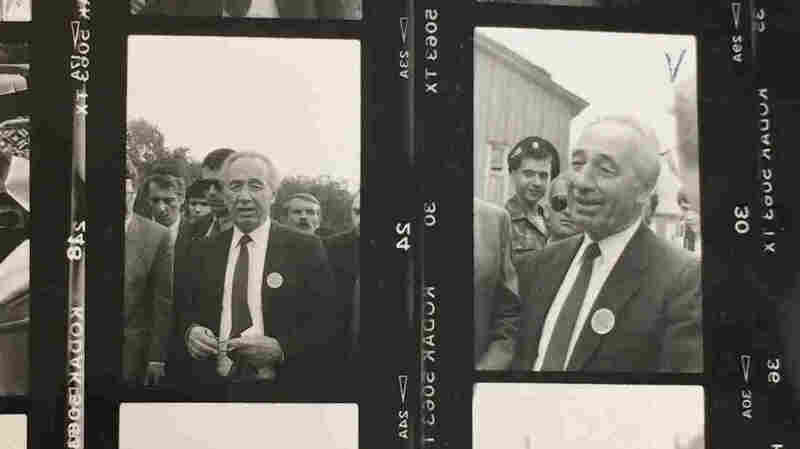 Shimon Peres, Israel's foreign minister at the time, visits his home village — once part of Poland, now in Belarus — in 1992. He was looking for his boyhood home, but it had long since been torn down. Like many of Israel's founding fathers, he traced his roots to Eastern Europe. In 1992, just months after the Soviet Union collapsed, Shimon Peres walked through a small town graveyard in Volozhon, overrun by weeds, searching for a tombstone with Hebrew writing on it in the newly independent state of Belarus. Peres, who died Tuesday, was Israel's foreign minister at the time. He was looking for the graves of his relatives, as well as his boyhood home. Like many members of Israel's founding generation, he was born in Eastern Europe and emigrated to the Middle East. The Cold War friction between the Soviet Union and Israel meant it was extremely difficult if not impossible to visit. But now Peres, born Szymon Perski in Wiszniew, Poland (now Vishnyeva, Belarus), Aug. 2, 1923, the son of a lumber merchant, was back in the place he was born. It was a region that had served as a spiritual core for Jews of Central and Eastern Europe before it was all but decimated during World War II and the Holocaust. Peres' parents were not Orthodox Jews, but the young Peres was taught the Talmud. His family left in the 1930s to escape religious persecution and reached what was then known as Mandatory Palestine, under British rule. His family's story mirrored my own family's — both sought religious freedom and a better life — and as a young reporter for The Moscow Times, I was determined to go along. I talked my way onto his private plane while he was visiting Moscow and sat next to him for the two-hour plan ride to Belarus. In his trademark low gravely voice, he reminisced about his childhood. "I hope to find the place I was born," he told me. He began humming, and then started singing in Yiddish. It was a lullaby his mother used to sing. When we arrived in Volozhon, he went house to house, knocking on doors asking if people remembered his family. The entire town had been burnt to the ground, and later rebuilt. Any house he might have recognized was gone. We came across a field overrun with weeds. Markers in Hebrew were in broken pieces on the ground, but he found one belonging to his great grandfather. He put on his yarmulke and solemnly said the Hebrew prayer for the dead. I took a picture of him saying the blessing and laying the traditional stone on the grave. No other journalists were present, and the picture was picked up by the Associated Press and ran in newspapers across the world. On the way back to Moscow, it was clear the visit had touched him deeply. He recalled his first encounter with anti-Semitism, decades earlier, when the local newspaper showed a picture of two Jews murdered in a nearby forest. "I understood for the first time that people were killed just because they were Jewish," he told me. But perhaps most moving for Peres was something he didn't find on his visit. "I wasn't prepared to find grass instead of a home," he said.